ASC has officially opened its upgraded facilities at ASC West in Henderson, Western Australia, strengthening Australia’s sovereign submarine capability. The upgrade is part of ASC’s continuous improvement of the maintenance of Australia’s Collins Class submarine fleet, as part of the Submarine Enterprise, which has achieved international benchmark performance this year. The $12.5 million redevelopment will improve productivity and reliability through a maintenance support tower, sky bridge and new amenities and office areas, significantly cutting the time workers spend accessing a submarine under maintenance. A similar upgrade at ASC’s South Australian facilities led to a 30 per cent improvement in submarine maintenance efficiency. 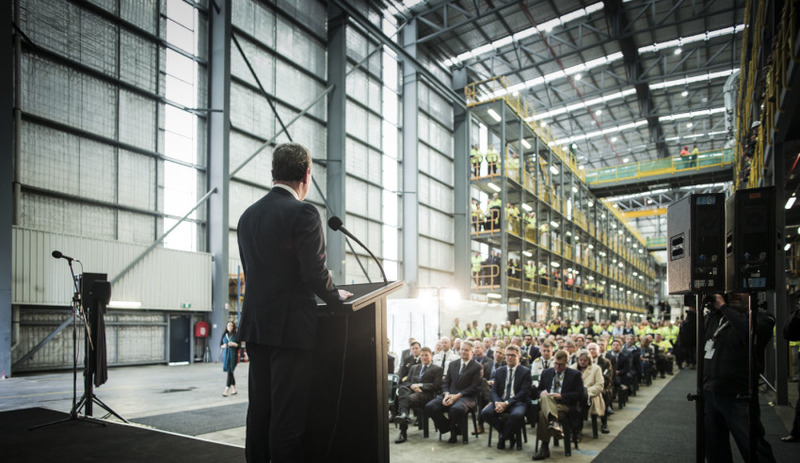 Finance Minister Mathias Cormann and Defence Industry Minister Christopher Pyne jointly opened the redevelopment at ASC West, at a ceremony attended by ASC management and personnel, senior Defence Department, Royal Australian Navy (RAN) and defence industry leaders. ASC interim chief executive Stuart Whiley said the major redevelopment marks the beginning of ASC's strong future in growing Australia's future submarine capability. "This major redevelopment at ASC’s WA facility lays a solid foundation for ASC’s future as a key sovereign asset delivering Australia’s submarine capability," said Whiley. "It is an exciting development that comes at a time of significant investment and commitment to growing Australia’s future submarine capability by the federal government. ASC looks forward to being a key part of delivering that capability growth." Minister Pyne said the opening of the upgraded facility is exciting for ASC and shows how far ASC has progressed in a short time. "This is another investment in the ASC workforce and the future of submarine sustainment at Henderson," said Minister Pyne. "It caps a really great success story where five years ago the view across the country was that ASC would not be able to build submarines, let alone sustain them and maintain them into the future. Now we’ve reached international benchmarks; submarine sustainment is a sovereign industrial capability that we are going to keep into the future for decades. That means jobs and investment into the future." West Australian Senator Cormann commended the progress of ASC and what it has achieved for the Collins Class submarines. "You guys have done an awesome job in recent years, lifting productivity and performance to world-class levels and it’s a real credit to you as a team and what you’ve been able to achieve around the nation in making sure that record availability of Collins Class submarines to do the work that we need them to do as a nation," Minister Cormann said. "The ASC West redevelopment demonstrates our commitment to growing Australia’s current and future submarine capability."